The November 24th edition of the BBC World Service radio programme ‘Newshour Extra’ was titled “The Battle for Lebanon“. Owen Bennett Jones’ guests were American-Iranian journalist Azadeh Moaveni, Lina Khatib of Chatham House, Fahad Nazer – a consultant to the Saudi Arabian embassy in the US capital and the Lebanese academic Amal Saad who – as was the case when she appeared on two editions of ‘Newshour’ a fortnight before – was inadequately presented to listeners as an “author”. The first topic of discussion was the background to Hariri’s resignation and in Amal Saad’s contribution listeners heard her dismiss Hariri’s claims of threats to his life, whitewash Hizballah involvement in the murder of his father and yet again – despite Hariri having returned to Lebanon by the time this programme was aired – repeat Hizballah spin concerning his supposed ‘abduction’. Later on in the programme (from 12:00) Bennett Jones asked Saad to explain Hizballah to listeners. Listeners consequently heard a highly airbrushed portrayal of Hizballah that misrepresented its origin as being rooted in the (completely unexplained) First Lebanon War and – unsurprisingly – failed to tell those listeners “who really aren’t familiar with Hizballah” anything at all about the reasons for its designation as a terror organisation by many Western and Gulf countries as well as by the Arab League. Obviously that evasive and highly partisan reply did not provide listeners with any understanding of the role played by Hizballah’s foreign-funded, heavily armed militia in its imposition of a state-within-a state model in Lebanon. Later on in the programme (from 19:14) listeners were told by Saad that Hizballah “hasn’t had any kind of role in Yemen in terms of sending weapons” but she did clarify that Nasrallah admitted to sending “weapons to the Palestinians”. When Bennett Jones asked her about the possibility of Hizballah “pull[ing] back from the regional stuff] her response was again to repeat Hizballah talking points. Bennett Jones refrained from questioning or challenging that debatable representation of events. Towards the end of the discussion (from 48:25) listeners heard Saad misrepresent the origins of Hizballah once more, together with an airbrushed presentation of the relationship between the terror group and Iran. If, as one must assume, the purpose of this programme was to enhance audience understanding of the complex story of Hariri’s resignation, his subsequent backtrack and the wider regional background, then clearly an accurate and impartial portrayal of Hizballah’s history, ideology and activities should have been one of its essential components. While Amal Saad was on occasion challenged by some of the additional contributors on various other points, the fact that Owen Bennett Jones assigned the task of ‘explaining’ Hizballah to an obviously partisan contributor, intent only on repeating the terror group’s own propaganda and messaging, actively hindered audience comprehension of this story. Over the last decade and a half BBC audiences have grown very used to hearing Israel’s anti-terrorist fence described as “controversial” or even worse. Despite the fact that the BBC’s ‘style guide’ instructs its staff to use the term ‘barrier’ to describe the structure, audiences very often hear or see it described as “the wall”. Not only is it is extremely rare for audiences to be informed of that counter-terrorism measure’s record of effectiveness, but BBC produced content frequently promotes the propaganda myth that it is intended to facilitate a “land grab” rather than to curb the number of Palestinian terror attacks against Israeli civilians. Following the terror attack in Manchester the BBC World Service radio programme ‘Newshour Extra’ – presented by Owen Bennett-Jones – devoted its May 27th edition to the question “How Can We Make Our Cities Safe?“. In short, even in a programme specifically relating to security and counter-terrorism that ostensibly sets out to inform listeners what other countries do to “minimise the risk to their citizens” and even as we see that the BBC clearly appreciates both the purpose and the efficacy of the anti-terrorist fence, the corporation cannot resist promoting its knee-jerk “controversial” theme and refrains from informing audiences of the actual statistics relating to the reduction in attacks following construction of the structure. As we saw in part one of this post, on May 31st Oxford professor Avi Shlaim appeared on the panel of BBC World Service radio’s ‘Newshour Extra’. There – unhindered by host Owen Bennett-Jones – Shlaim was given a platform from which to promote assorted inaccurate and politically partisan versions of Middle East history as well as the risible notion that the root cause of the absence of peace, security and stability in the entire region is the Arab-Israeli conflict. In addition, the BBC platform was used to mainstream to millions of listeners around the world the notion that the only way to achieve peace in the Middle East is by dismantling the Jewish state and denying Jews the right to self-determination. No less insidious was Shlaim’s idealisation of Jewish life in Iraq – all the more pernicious given Shlaim’s title of ‘historian’. So according to Shlaim the historian, all was sweetness and light for Jews in Arab lands in general and Iraq in particular until the Arabs lost the war they initiated against the newly declared Israeli state in 1948. One might have thought that a historian would have remembered to mention the one of the most important events in the Iraqi Jewish community’s modern history – the Farhud of 1941 – especially as that event’s anniversary was marked just one day after this programme was broadcast. Of course anyone familiar with Avi Shlaim’s record will be well aware of the fact that more often than not his political views – along with his self-awarded role of “judge and jury” – shape his accounts of history and his portrayal of Zionism as “a European idea and a European project” in this broadcast is a classic example of Shlaim’s seemingly unlimited ability to ignore inconvenient facts such as the First Aliyah wave of immigrants from Yemen and the event – the Farhud – which signalled that relations between Iraqi Jews and their neighbours were not quite as “harmonious” as Shlaim would have listeners believe. The trouble with this BBC programme is that the vast majority of those listening to the radio show will not be familiar with the prolific political activities of the learned professor and will not be able to apply the necessary context of his underlying agenda to the ostensibly neutral and academic analysis he provides. And of course the real issue is that Owen Bennett-Jones and his BBC colleagues made no effort whatsoever to provide audiences with the information necessary for them to appreciate that any application of context and critical thinking was required at all. “There are many explanations for the winds of change sweeping through the Middle East. 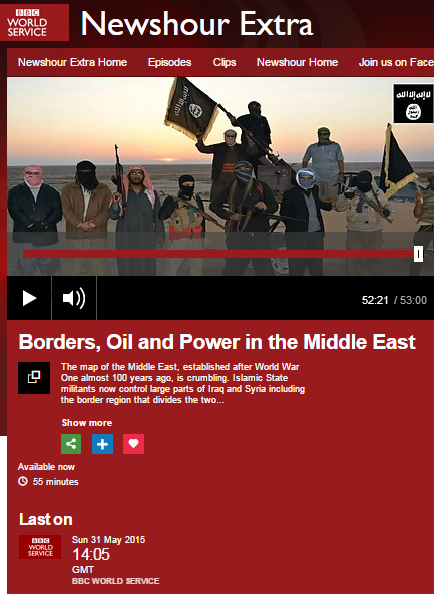 Readers who ventured to the end of Bennett-Jones’ piece discovered that it is based on an edition of the BBC World Service radio programme ‘Newshour Extra’ – titled “Borders, Oil and Power in the Middle East” – which he hosted on May 31st. What they are not told in the written article is that the main reason for the bizarre appearance of Zionism on his list of “explanations” for the ongoing violence in the Middle East is the inclusion of Oxford University’s Avi Shlaim on Bennett-Jones’ guest list for that programme. Those familiar with Avi Shlaim’s political activism (albeit often thinly disguised with an academic veneer) will not have been surprised by his ability to repeatedly bring the focus of the programme back to his pet topic of Israel. Listeners may have been equally unsurprised to find that the programme’s host and editors indulged his hobby, particularly after the tone was set in Bennett-Jones’ introduction. From around 04:30 listeners heard the following supposedly objective and academic account of the background to the topic under discussion from Avi Shlaim. The most striking aspect of Bennett-Jones’ failure to relieve listeners of the misleading impressions provided by Shlaim, however, is that the BBC had every reason to be capable of anticipating exactly how he was going to frame the issue because he had done it before on BBC Radio 4 in October 2013. No less interesting is the fact that despite Shlaim’s obvious and repeatedly expressed enthusiasm for Kurdish independence as promised in 1920, Bennett-Jones refrained from asking him why in his opinion the Treaty of Sèvres should be considered any less “illegitimate” than the Balfour Declaration or the Sykes-Picot Agreement. Of course it is inaccurate and misleading to suggest that a “border between Israel and Palestine” existed under “the post-World War One territorial order”. Towards the end of the programme (at around 41:30), Bennett-Jones informs listeners that the discussion will “look ahead to what’s going to happen to various groups in the Middle East”. If listeners thought that they were finally going to get to hear some information about the situation of Christians, Yezidis, Druze, Armenians, Baha’is or any of the many other Middle East minorities unmentioned so far, they would have been disappointed. Instead, a full five minutes is spent discussing the topic introduced by Bennett-Jones at the start of that segment. According to the CIA World Factbook, life expectancy in the Gaza Strip in 2014 was 74.64 years – higher than that in one hundred and thirteen other countries or territories and higher than that for males in Blackpool or Glasgow, which BBC audiences would of course be unlikely to hear described as places “where you die slowly”. Following that (from around 45:25), listeners hear Avi Shlaim telling them that there will be no peace or stability in the Middle East until Jews lose their right to self-determination. No attempt is made by the programme’s host to inform listeners of the significance and consequences of the ‘solution’ to all the Middle East’s troubles as put forward by Shlaim and likewise no effort is made to relieve them of the ridiculous notion that ISIS jihadists are slaughtering Yezidis, Kurds and Christians (among others) and Bashar al Assad is killing his own people because the Arab-Israeli conflict has yet to be resolved. Amazingly, this is what passes for objective, impartial, factual and accurate analysis of the Middle East as far as the BBC World Service is concerned, but Avi Shlaim’s historical misrepresentations had not finished there – as we shall see in part two of this post.